For other people named Adrian Smith, see Adrian Smith (disambiguation). Adrian Frederick "H" Smith (born 27 February 1957) is an English guitarist and member of Iron Maiden, for whom he writes songs and performs live backing vocals on some tracks. Smith grew up in London and became interested in rock music at 15. He soon formed a friendship with future Iron Maiden guitarist Dave Murray, who inspired him to take up the guitar. After leaving school at 16, he formed a band called Urchin, which he led until their demise in 1980. He joined Iron Maiden in November 1980, replacing Dennis Stratton. Following a short-lived solo project called ASAP, he left Iron Maiden in 1990 and formed a group called Psycho Motel. In 1997, Psycho Motel was put on hold and he joined the band of former Iron Maiden singer Bruce Dickinson. Smith and Dickinson returned to Iron Maiden in 1999, after which the band gained new success. Smith has a current side project called Primal Rock Rebellion. Born in Hackney, Smith grew up in Clapton. He purchased his first record, Deep Purple's Machine Head, at the age of 15. This led him to befriend Dave Murray, with whom he formed a band called Stone Free, which comprised Murray on guitar, Smith on vocals and their friend, Dave McCloughlin, playing the bongos. After seeing the attention Murray received from girls, Smith took up the guitar, starting with an old Spanish guitar once owned by his brother, before purchasing an old one of Murray's for £5. His early influences included Johnny Winter and Pat Travers, which he claims made him a "melodic player" rather than a "speed merchant or a shredder" as he "was inspired by blues rock rather than metal." Leaving school after completing his O-levels, Smith formed a band called Evil Ways, including Dave Murray on guitar, which was later renamed Urchin. Smith began writing his own material, including "22 Acacia Avenue", which was later included on Iron Maiden's The Number of the Beast (1982). At this point, Murray left the band to join Iron Maiden and Urchin signed with DJM Records and released a single, "Black Leather Fantasy", in 1977. Shortly afterwards, Murray joined Urchin on their next single, "She's a Roller", as he had been sacked from Iron Maiden after a row with then vocalist Dennis Wilcock, although he was reinstated six months later. Smith was also offered a place in Iron Maiden while they were in the process of signing with EMI in 1979, but turned them down to continue with his own band, a decision he later regretted as Urchin split up in 1980. Without a band, Smith was left "wondering what to do next," before he "literally bumped into Steve [Harris] and Dave," who asked if he might want to reconsider joining. After a successful audition, Smith debuted with the band on a German TV show, before setting out on a UK tour and recording the Killers album, released in 1981. Smith's first song-writing contributions appeared on The Number of the Beast, co-penning "Gangland" and "The Prisoner", as well as the previously mentioned "22 Acacia Avenue", after which he began co-writing many songs with singer Bruce Dickinson, on the following Piece of Mind album. Smith and Dave Murray combined playing dual lead guitars, creating what AllMusic calls "the most formidable twin-guitar attack in heavy metal, outside of Glenn Tipton and K. K. Downing." Smith, along with Steve Harris, also provides the band's backing vocals, although he sang lead on "Reach Out", the B-Side to the "Wasted Years" single, featuring Bruce Dickinson on backing vocals. Originally written by guitarist Dave "Bucket" Colwell, whom he had worked with on The Entire Population of Hackney project, Smith would later sing "Reach Out" again for Colwell's solo album, Guitars, Beers & Tears, released in 2010. While Iron Maiden were taking some time off in 1989, Smith released a solo LP with the band ASAP (Adrian Smith And Project), entitled Silver and Gold, which was a commercial failure in spite of a promotional club tour. Unhappy with the direction the band were taking for their next release, No Prayer for the Dying, and feeling that he could not help enough in the creative work, Smith agreed to leave Iron Maiden in 1990 during the album's pre-production stages, and was replaced by Janick Gers. After releasing the experimental Somewhere in Time and Seventh Son of a Seventh Son albums in 1986 and 1988 respectively, Steve Harris had decided that the band should go for a "stripped-down," "street level" approach, which Smith thought was a "step backward." No Prayer for the Dying contained one last Smith song, co-penned with Bruce Dickinson, entitled "Hooks in You". After leaving, Smith started a family with his Canadian wife, Nathalie, and would not play guitar again until he joined Iron Maiden onstage at Donington Park in 1992 to perform "Running Free". In the same year, after hearing King's X for the first time, he decided that he would "love to play in a band like that" and formed The Untouchables, which later became Psycho Motel. The band recorded two albums, State of Mind in 1996 and Welcome to the World in 1997, during which they supported Iron Maiden on the British leg of The X Factour. The project was put on hold, however, when Smith joined Bruce Dickinson for his 1997 album, Accident of Birth, after which he became a full-time member of Dickinson's solo outfit, embarking on two world tours and contributing to one further studio release, 1998's The Chemical Wedding. Smith performing with Iron Maiden during the Somewhere Back in Time World Tour. In 1999, Smith re-joined Iron Maiden, along with vocalist Bruce Dickinson, who commented, "When he left the band in 1990, I think everybody was a bit surprised at how much we missed him and certainly, I don't think anybody had realized how much the fans would miss him – big time. I wouldn't have rejoined Iron Maiden if he wasn't in the band. I just don't think it would have been complete without Adrian, and now, it's great having three guitarists." The band embarked on a short tour, after which the new line-up's first album, Brave New World, was recorded with producer Kevin Shirley and released in 2000. He remains in Iron Maiden, with whom he has released four further studio albums, 2003's Dance of Death, 2006's A Matter of Life and Death, 2010's The Final Frontier and 2015's The Book of Souls. Smith claims that his guitar playing improved after leaving the band in 1990, in particular while working with Roy Z, from whom he "learned a lot about picking" and became "more disciplined." Since returning to Iron Maiden, he has also continued experimenting with tuning (which he began doing in Psycho Motel), stating that he has used drop D tuning in live renditions of "Run to the Hills", "Wrathchild", "The Trooper" and "Hallowed Be Thy Name". Although Smith had previously been known to contribute shorter, more "commercial" tracks, since his return to the band he has penned many longer songs, beginning with "Paschendale" from Dance of Death. Smith performs lead guitar, bass and backing vocals on the album Awoken Broken by his collaborative studio project with Mikee Goodman of SikTh called Primal Rock Rebellion. The title was released on 27 February 2012, while one song, "I See Lights", was released as a free download on the project's official website on 2 January. Adrian Smith was born in Hackney Hospital and grew up a few streets away from his childhood friend, and current bandmate, Dave Murray. Smith, whose father was a painter and decorator from Homerton, was the youngest of three, with an older brother, Patrick, and a sister, Kathleen. As a child, he was "a Manchester United fanatic," although he would lose his interest in football once he got into music. In his spare time, Smith is a keen angler, revealing that he used to take "worms and maggots" with him on tour, and was featured on the front cover of Angler's Mail on 25 August 2009. For over 20 years, he has been married to his Canadian wife, Nathalie Dufresne-Smith, who currently works for Maiden Flight, a cancer awareness/ patient rights organisation, and the pair have three children, Dylan, Natasha, and Brittany, the last of whom works as a professional film production assistant. Smith performing with a Jackson guitar. Smith currently prefers to use his Jackson signature 'San Dimas' Dinky, although he has used a variety of guitars over his career, including several different Dean models, various Jacksons, including the Randy Rhoads model, Fender Stratocasters (including three Fender Floyd Rose Classic Stratocasters; one with an added Roland midi pick-up), Gibson Les Pauls, Gibson Explorers, Gibson SGs, an Ibanez Destroyer, a Hamer Scarab, and Lado Guitars. On the A Matter of Life and Death DVD, he says the first decent guitar he bought was a Gibson Les Paul Goldtop, which he paid £235 for when he was 17. He still uses it to this day, stating that "it's still probably the best guitar I've got". As of 2010, his touring guitars include: a Gibson Les Paul Goldtop with DiMarzio Super Distortion in bridge position, his Jackson Superstrat 1986 prototype (which can be seen in the Maiden England video) with the pickguard changed to resemble his signature model, a Jackson Signature model with black scratchplate and maple neck, an early 70s Gibson SG, and another Jackson, inspired by his Les Paul Goldtop. As of August 2007, Adrian Smith endorses Jackson Guitars, his first guitar company endorsement in over fifteen years. With Jackson he has released two signature models, a San Dimas Dinky and an SDX. Prior to his endorsement, he was seen using other Jackson guitars, such as a King V during his time in Bruce Dickinson's solo band, before he went to Fender guitars. In August 2008, he had a Jackson guitar stolen from backstage at a show in Greece. Iron Maiden – Live at Donington (1992) – "Running Free"
Michael Kiske – Instant Clarity (1996) – "The Calling", "New Horizons", "Hunted"
Humanary Stew: A Tribute to Alice Cooper (also released as: Welcome to Nightmare: An All-Star Salute To Alice Cooper) (1998) – "Black Widow"
Dave Colwell – Guitars, Beers & Tears (2010) – Lead vocals on "Reach Out", lead vocals and lead guitar on "Make Up Your Mind"
Kym Mazelle – Destiny (2010) – Writer, producer, guitar, bass and backing vocals on "My Shoes"
The Royal Philharmonic Orchestra Plays the Music of Rush (2012) – "Red Barchetta"
Celtic Pride – Light Up The Sky (2012) – Guitar solo on "The Patriot"
^ a b c d Wall 2004, p. 164. ^ Bushell, Garry; Halfin, Ross (1985). Running Free, The Official Story of Iron Maiden (2nd ed.). Zomba Books. p. 80. ISBN 0-946391-84-X. ^ a b Wall 2004, p. 165. ^ Wall 2004, p. 41. ^ Wall 2004, p. 166. ^ a b c McIver, Joel (1 December 2010). "Iron Maiden: Adrian Smith". Total Guitar (208): 40–42. ^ a b Wall 2004, p. 167. ^ Wall 2004, p. 168. ^ Wall 2004, pp. 168-69. ^ Wall 2004, p. 169. ^ Wall 2004, p. 170. ^ Wall 2004, p. 171. ^ Wall 2004, p. 224. ^ Wall 2004, p. 244. ^ Huey, Steve. "Iron Maiden – Piece of Mind review". AllMusic. Rovi Corporation. Retrieved 28 September 2011. We also get greater involvement in the songwriting from Bruce Dickinson and Adrian Smith, whose themes are perfectly in tune with Steve Harris' epic storytelling. ^ Huey, Steve. "Iron Maiden – Killers review". AllMusic. Rovi Corporation. Retrieved 28 September 2011. ^ Wall 2004, p. 261. ^ "Iron Maiden guitarist Adrian Smith Featured on New Album From Former ASAP Bandmate Dave "Bucket" Colwell". Brave Words & Bloody Knuckles. 7 September 2010. Retrieved 21 November 2012. ^ James, Darren (2005). "Stranger in a Strange Land". Metal Hammer presents: Iron Maiden 30 Years of Metal Mayhem: 75. ^ Wall 2004, p. 273. ^ Wall 2004, p. 274. ^ a b Wall 2004, p. 283. ^ Fuentes Rodríguez, César (October 1997). "Dos para triunfar" [Two to triumph]. Epopeya (in Spanish). Argentina: Llamoso. ^ Wall 2004, p. 284. ^ Wall 2004, p. 285. ^ Wall 2004, p. 286. ^ a b c d e Wall 2004, p. 326. ^ Ling, Dave (2005). "Adrian Smith". Metal Hammer presents: Iron Maiden 30 Years of Metal Mayhem: 64. ^ Wall 2004, p. 327. ^ "Adrian Smith as known by Bruce Dickinson". ironmaiden.com. Archived from the original on 13 July 2011. Retrieved 11 February 2012. ^ Wall 2004, p. 342. ^ Wall 2004, p. 375. ^ Bezer, Terry (23 November 2010). "Iron Maiden & Sikth Members For 'Supergroup'". Metal Hammer. Archived from the original on 26 November 2010. Retrieved 21 November 2012. ^ Hartmann, Graham (2 January 2012). "Iron Maiden's Adrian Smith Unleashes First Single with Primal Rock Rebellion". Loudwire. Retrieved 21 November 2012. ^ Hartmann, Graham (10 January 2012). "Iron Maiden's Adrian Smith Talks Side Project Primal Rock Rebellion". Loudwire. Retrieved 21 November 2012. ^ Wall 2004, p. 40. ^ "Iron Maiden's Adrian Smith: 'I used to take worms on tour'". NME. 25 August 2009. Retrieved 29 September 2011. ^ "Board of Directors". Maiden Flight. Archived from the original on 10 April 2009. Retrieved 28 September 2011. ^ Iron Maiden (6 June 2011). "Iron Maiden Thank- Adrian Smith:". From Fear to Eternity Booklet. EMI. ^ "Writer/Director James Gunn Reveals the Odd Connection Between Iron Maiden's Adrian Smith, Benecio Del Toro, and Guardians of the Galaxy". MetalSucks. 24 November 2014. Retrieved 21 February 2015. ^ a b c d e f g Heatley, Michael (2005). "Hardware". Metal Hammer presents: Iron Maiden 30 Years of Metal Mayhem: 69. ^ a b "Documentary". A Matter of Life and Death (DVD). EMI. 28 August 2006. ^ a b "1970s Gibson Les Paul Goldtop – Adrian Smith". Premier Guitar. November 2010. Retrieved 29 September 2011. ^ "Custom Jackson – Adrian Smith". Premier Guitar. November 2010. Retrieved 29 September 2011. ^ "Adrian Smith Signature Jackson". Premier Guitar. November 2010. Retrieved 29 September 2011. ^ "Gibson SG – Adrian Smith". Premier Guitar. November 2010. Retrieved 29 September 2011. ^ Bradley, Simon (24 June 2009). "Jackson Adrian Smith San Dimas DK". MusicRadar. Archived from the original on 11 February 2013. Retrieved 21 November 2012. ^ Hewitt, Hayden (30 October 2012). "Jackson Adrian Smith SDX". MusicRadar. Archived from the original on 11 February 2013. Retrieved 7 January 2013. ^ Knapton, Sarah (6 August 2008). "Iron Maiden guitar stolen in Greece". The Daily Telegraph. Retrieved 21 November 2012. ^ a b c d e f g h i j "Adrian Smith Rig Diagrammed". Guitar World. 1 December 2006. ^ a b c d e f g h i j Bosso, Joe (19 October 2015). "Iron Maiden: Out of Thin Air". Premier Guitar. Retrieved 5 August 2016. ^ a b "Adrian Smith's MIDI Foot Controller". Premier Guitar. November 2010. Retrieved 29 September 2011. ^ a b c d e "Adrian Smith's Rack". Premier Guitar. November 2010. Retrieved 29 September 2011. ^ Rivadavia, Eduardo. "Earthshaker- Earthshaker". AllMusic. Rovi Corporation. Retrieved 31 January 2012. ^ Adams, Bret. "Various Artists – Hear 'n Aid". AllMusic. Rovi Corporation. Retrieved 13 September 2014. ^ Huey, Steve. "Various Artists – Humanary Stew: A Tribute to Alice Cooper". AllMusic. Rovi Corporation. Retrieved 13 September 2014. ^ "Iron Maiden guitarist featured on The Royal Philharmonic Orchestra Plays the Music of Rush". Blabbermouth.net. 23 October 2012. Retrieved 13 September 2014. ^ Hartranft, Craig (30 January 2013). "Celtic Pride: Light Up the Sky". Dangerdog. Retrieved 13 September 2014. 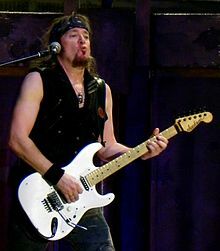 Wikimedia Commons has media related to Adrian Smith.